One of the biggest pieces of Response to Intervention is documenting, documenting, documenting. 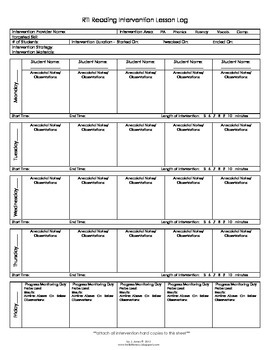 Once you and/or your grade level team determine which students need the same targeted intervention, whether it's long and short vowels, fluency with repeated readings or using context clues to increase vocabulary knowledge, for example...use this log sheet for a small group of 1-5 students to document your intervention area, skill, length of intervention and anecdotal notes and observations...with room on Friday to document progress monitoring results. I usually keep each group's lesson log sheet on one side of a two-pocket folder with any lesson materials and progress monitoring hard copies in the other pocket. For more information on possible interventions, see my "If, Then - Reading Interventions Menu" in my TpT store or my blog to see how we do RtI at our school. Thanks for looking, buying or adding to your wishlist.